Senior Pakistani, Afghan and US diplomats and military officials jointly visited the Pakistan-Afghanistan border last Saturday to ascertain where the boundary should lie, according to a US army statement issued from the Bagram airbase in Afghanistan on Wednesday. Mandated by a six-month-old tripartite commission tasked with resolving problems on the controversial border, the officials visited four border posts on the Afghan side in Nangarhar Province, having earlier visited the area in July to confirm locations, confirmed by satellite pictures, for three Pakistani posts, the statement said. But the task of the tripartite commission formed by the US to resolve border disputes between Pakistan and Afghanistan, two key allies in the US-led war on terrorism, seemed to have become a "mapping exercise", according to one analyst. "The commission seems to be arguing about local, technical disputes. What I’ve heard from sources seems to suggest that it’s become a bit of a mapping exercise, more than anything else," Ahmed Rashid, a Pakistani journalist and author of the best-selling book, Taliban, told IRIN from the eastern Pakistani city of Lahore. Formed in June to resolve security issues between its member states, the commission has already held meetings in Afghanistan and Pakistan with the issue of a colonial-era border demarcation, already the cause of much public acrimony between the two countries, still, somehow controversially, unresolved. Security was the top priority when the two sides talked about border issues, but, despite remaining concerns, as a member of the tripartite commission, he felt a balanced and positive attitude from the Pakistani side in their last meeting, Helaluddin Helal, the Afghan deputy interior minister, told IRIN in the Afghan capital, Kabul. "I believe the international community’s pressure has made the Pakistani government act responsibly: that is why they have received our factual criticism, or claim, and promised to look at it. This was not the case in the past," he maintained. "This is an old issue that won’t go away so soon. It is a controversy that will take some time before it is resolved. Perhaps, the involvement of the United States will facilitate a solution," the veteran journalist, Rahimullah Yusufzai, told IRIN from his village near Pakistan's North-West Frontier Province (NWFP) town of Mardan. However, as the executive editor of the Peshawar bureau of The News, an English broadsheet, Yusufzai said he did not think that a proper solution could be worked out until Afghanistan elected its first post-conflict government in June 2004. "Until a proper government is elected next year, this commission can prepare maps, exchange views and prepare the ground for the new government," he noted, pointing to the fact that the Hamid Karzai-led, US-backed government was still only an "interim administration". The issue at stake is a border delineation agreed to in 1893 between Sir Henry Mortimer Durand, then foreign secretary in British India, and the king of Afghanistan. The Afghan government says the agreement, separating British India from Afghanistan along what is known as the Durand Line, was valid only for 100 years and expired in 1993. The Pakistani government consistently maintains that there is no dispute and that the Pakistan-Afghanistan border stands as it always has, without doubt. "These two countries are existing side by side since 1947. There is no Durand Line - it is finished. As far as we’re concerned, it is a story of the past. There is just the Pakistan-Afghanistan border," Maj-Gen Shaukat Sultan, the Pakistani presidential spokesman, told IRIN in the capital, Islamabad. Last week, after Pakistan announced it had begun fencing its border with Afghanistan, Sultan told a private television channel that the move had been considered necessary to block the infiltration of Islamic militants into Afghanistan. "It shall also clearly mark the border," he stated, but declined to reveal how long the fence was going to be. The Durand Line is said not to have been in doubt when Pakistan was established in 1947. However, in later years, the legitimacy of Pakistan’s 2,250-km border with Afghanistan came to be questioned periodically by successive Afghan governments, with Pakhtun tribes, which straddle both sides of the border, also chipping in with their demand for a provision allowing easier access to each other. It was usual for countries sharing borders to have some disputes or misunderstandings, Abdul Hamid Mubarez, the Afghan deputy information and culture minister, told IRIN in the capital, Kabul. "But we live in the contemporary world and this is not a time of land occupations or intrusions; in fact, it is a time of coexistence, reconciliation and negotiation," Mubarez, a famous journalist active for 50 years, added, saying he believed the dispute could be solved through talks. [Afghanistan] Provincial authorities in the south claim the Taliban are hiding in the mountains and are launching their terrorist activities as they find opportunity. "Border problems erupt mainly when the people on both sides of a border are from the same tribes and they sometimes end up with tension and disputes among them," he said, pointing out that both Pakistan's and Afghanistan’s closely linked economic interests should serve to facilitate the resolution of political issues through "comprehension and understanding". "Actually, this controversy has existed for over 100 years. The people in the tribal areas were opposed to the Durand Line, because kin were separated from each other, most families were divided by it," Haji Adeel, a former Speaker of the NWFP provincial assembly, told IRIN from the province’s capital, Peshawar. "The Pakhtuns want to be together, they want that there should be no geographical division among them." "[The Durand Line] was not a natural border of Afghanistan, but an imposed border by Britain to protect its boundaries from Russia. History proves that the land beyond the Durand Line was a part of Afghanistan, but we are not raising - and have never raised - land claims," Mubarez stressed. "We have always been asking that the destiny of the Pashtuns and the Baluchis on the other side of the border should be specified, and, if today, Pashtuns and Baluchis themselves want to live on the other side, we have no objection," he maintained. A spokesman for the US-led coalition forces hunting for remnants of Osama bin Laden’s al Qaeda network in Afghanistan said the tripartite commission’s meetings had made useful achievements. "One of the achievements is good communication that did not exist in the past," Col Davis Rodney told IRIN in Kabul. Better communication helped in facilitating operations being conducted along Afghanistan’s border with Pakistan, he said. "We are being assisted by Pakistan in the east; that is certainly a positive development," Rodney stressed. Thousands of Pakistani troops have been deployed in the rugged, mountainous hinterlands of the NWFP and the southwestern province of Balochistan, both of which border Afghanistan, to hunt for escaped Taliban and Al-Qaeda leaders thought to have taken refuge in Pakistan’s semi-autonomous Tribal Areas. The presence of the troops is also considered essential to efforts to thwart the suspected movement of militants across border terrain that is difficult to police, Pakistani authorities have said. The tribal agencies of North Waziristan and South Waziristan, both of which lie just across the border from the three "flashpoint" Afghan provinces of Paktia, Paktika and Khowst, have been cited as likely sanctuaries for Al-Qaeda and Taliban operatives for over two years, Yousufzai wrote in an analysis for the Central Asia-Caucasus Institute in early October. "Their Pashtun population is largely sympathetic to the mainly Pashtun Taliban," he wrote, pointing out that the three adjacent Afghan provinces, mainly inhabited by Pashtun tribes, were the most dangerous for coalition soldiers, with missile attacks on coalition bases and convoy ambushes almost a matter of daily routine. "The only problem we have is the concern of cross-border terrorism by the Taliban and their Al-Qaeda allies, who are trained and given money in Pakistan," Asadullah Wafa, the governor of Afghanistan's Paktia Province, told IRIN. 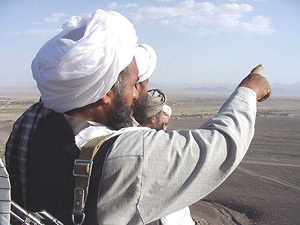 With over 10 million Pashtun citizens of its own, Pakistan sought to offset Afghan territorial claims and rejections of the Durand Line as an international border by supporting Afghan Islamic parties, beginning in the early 1970s, an International Crisis Group (ICG) report said in August. Many Afghans believed that Pakistan had exacerbated the ethnic component of the bilateral conflict by pursuing a lopsided policy of supporting Pashtun Islamic rule, the ICG report added, referring to Islamabad’s perceived need for a stable western border, the acquisition of strategic depth against India and the prospect of using Afghanistan as a gateway to Central Asian markets sharpening its resolve to support the Taliban despite heavy political, diplomatic and economic costs. "Pakistan cannot be connected to rich Central Asia without a friendly Afghanistan, and Afghanistan cannot send Central Asian products outside without having good relations with Pakistan," Mubarez said, noting that this was a critical issue for both countries. "We have no alternative but to seek solutions through discussions. We cannot be separated from each other. If there is a united Europe today, we should also work in the region to get closer," he added. Moreover, the hunt for resurgent Taliban and Al-Qaeda militants provided a specific reason for Pakistani military presence on the border, Mubarez said. "We also want to get rid of [the Taliban]. So, in short, I should say that a special and complicated situation exists which requires patience and tolerance," he added. However, the presence of over 60,000 troops in the lawless Tribal Areas has not been without negative incidents. Soon after Pakistan decided to send military forces into the Mohmand Agency in search of Al-Qaeda members in late June - prompting Pakistani President Pervez Musharraf to boast during a tour of the US, UK, Germany and France that this was the first time in over a century that such a force had entered that area - the Afghan government accused Pakistan of "intruding into Afghan territory" and setting up border posts inside Afghanistan. One claim said Pakistani forces had moved as much as 40 km into Afghan territory, a charge that incited a large and incensed mob to attack the Pakistani embassy in Kabul in early July. Soon thereafter, sporadic firing by Afghan and Pakistani forces from their border outposts at each other increased in volume, and authorities on both sides moved swiftly to contain the damage before it snowballed into full-blown conflict. "The recurring exchange of fire between Pakistani and Afghan troops along their common border comes as a powerful wake-up call, marking a considerable deterioration in the already half-frosty ties between the two countries," Farhan Bokhari, a leading Pakistani analyst, wrote in the popular Gulf News, soon after the first border skirmish in July. 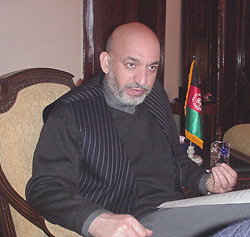 Karzai apologised for the incident and offered compensation for the damage suffered by the mission, but reiterated his claim that Pakistani forces had intruded "about 600 metres into Afghan territory", backing down from Kabul’s earlier assertion of forces having penetrated 40 km into Afghanistan, the Dawn daily, a leading English broadsheet, reported at the end of July. Soon afterwards, the newspaper quoted a senior Pakistani official as saying Pakistani forces had not crossed the border. "In fact, we are minus one kilometre from the zero line," it quoted the official as saying. "The initial claim was an alleged intrusion by Pakistani troops 500 to 600m into Afghanistan," Sultan said, adding that the tripartite commission was set up when the issue was raised, and following Pakistan’s vehement denial. "As far as we’re concerned, nowhere and never have Pakistani troops intruded into Afghan territory," he asserted, adding that the commission had then set up a sub-committee which visited both sides of the border to ascertain for itself the state of affairs and then presented its findings at a recent meeting in Rawalpindi. The commission was scheduled to meet again in mid-November, in Kabul, he added. "The committee is using all the instruments available, through satellites and on the ground, to establish the correct state of affairs," Sultan stated, referring to a satellite-based Global Positioning System introduced in late July to work out coordinates and match these to maps to resolve the problem. Then, at a detailed briefing at the Pakistan army’s corps headquarters in Peshawar, attended by Afghan representatives, US military officials and senior Pakistani civil servants, "the Afghans brought Russian maps of the [Pakistani-Afghan] border, the Americans had their own maps and we gave them ours," Dawn quoted one Pakistani senior official as saying. [Afghanistan] Afghan President Hamid Karzai. "I think that’s partly the reason the problem exists," Yusufzai said, referring to the British maps used by Pakistan and the Russian maps produced by Afghanistan. "They both have different delineations, so, obviously, there’s going to be a difference of opinion," he noted. Then, after a tripartite commission meeting held in Bagram in mid-August, the Afghan government requested US mediation in ensuring that a re-demarcation of the Durand Line was done - a request quickly shot down by Pakistan, which termed it "unacceptable" in a communiqué to the Kabul administration, another leading Pakistani English broadsheet, The Nation, reported. "[Pakistan] had conveyed to Kabul that the present Afghan government was interim and, as such, had no authority to touch such a significant matter," the newspaper said, adding that the Afghan government wanted the mandate of the commission to be expanded to empower it to make decisions. Ahmed Rashid agreed, pointing out that while the Commission is "certainly a high-powered crew, what is needed is a bigger mandate". "It should be one that has some political powers," he said, warning that, otherwise, the "sensitive issue" would just linger on. "The Afghans don’t see the issue as we do, and Pakistan can’t take its position unilaterally. If it does, it would be ignoring the feelings of the Afghans," he said. "That is the real problem: there is a lack of trust," agreed Yusufzai. "The real question is: why didn’t the Pakistan government get a pliant government - that’s the Taliban - to do something about it when they were in power?" Rashid asked, adding that it was important to put into perspective the fact that there was a big power-play going on in Kabul. "The hardliners want him [Karzai] to take a tougher line and therefore, every time this issue crops up, they stand to see Karzai get embarrassed. They want to embarrass him politically into taking a stand he might not do otherwise," he said.